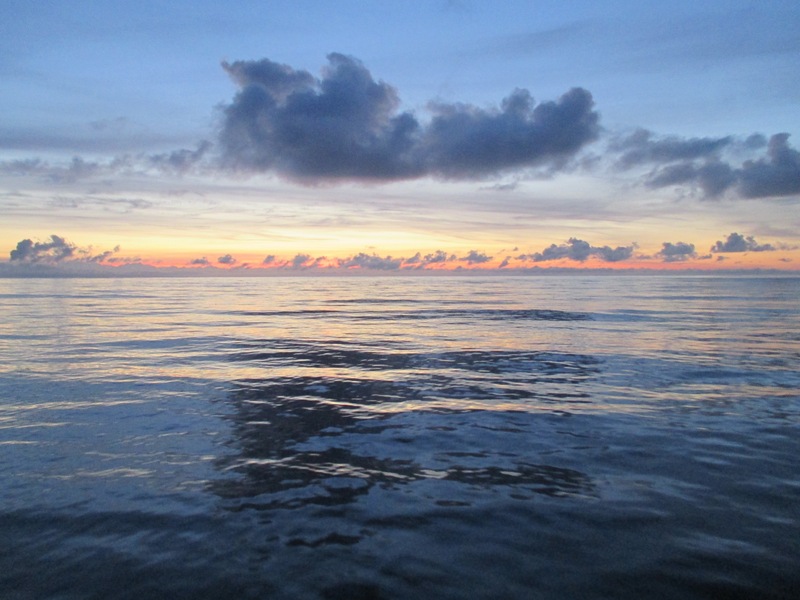 Our final days aboard the NOAA ship Oscar Dyson were action-packed! Though our trawling operations were finished, the science team had plenty to do, mainly calibrating, and cleaning, and camera drops. 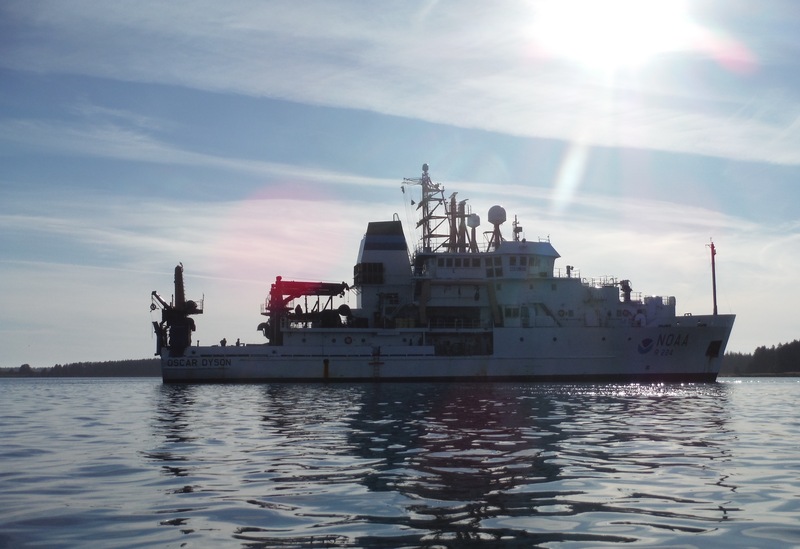 For the echosounder calibration process, the ship was brought into the calm waters of Otter Bay near Yakutat, Alaska. The process involved lowering tungsten carbide and copper spheres into the water at prescribed depths; these standard targets have a known echo return at particular echosounder frequencies, so our scientists can make sure the echosounders are working properly. This calibration process was done at the beginning of the survey and now again at the end. It is important for scientists to calibrate their echosounder equipment as often as is practical in order to ensure the equipment is working consistently so that they have accurate data. To accommodate the calibration, the ship had to stay in place for about 8 hours. After our shift ended, the bridge gave Emily and I permission to take a kayak into the bay. Allen and Rob each held a line connected to an end of the kayak, and they lowered it into the water from the deck. To get in the kayak, we had to climb down a rope ladder to right over the water level, then lower ourselves down to our seats. Thankfully, Emily and I managed to do this without tipping ourselves over! She and I each had a life preserver on, and we had a radio with us to communicate with the bridge. It was so fun to go for a paddle. The Oscar Dyson faded into the distance as we made our way towards the shore. We hugged the coast of the bay, surrounded by gorgeous alpine scenery. In the shallow water, we saw large sea stars, mounds of clams, and lots of scurrying crabs. After about an hour, we made our way back to the ship, exhilarated from our kayak adventure. We also spent a day cleaning the wet lab from top to bottom, including all the baskets, walls, and counters. We had to rid all its surfaces of pesky fish scales, so we spent hours scrubbing, soaping, and spraying everything down. 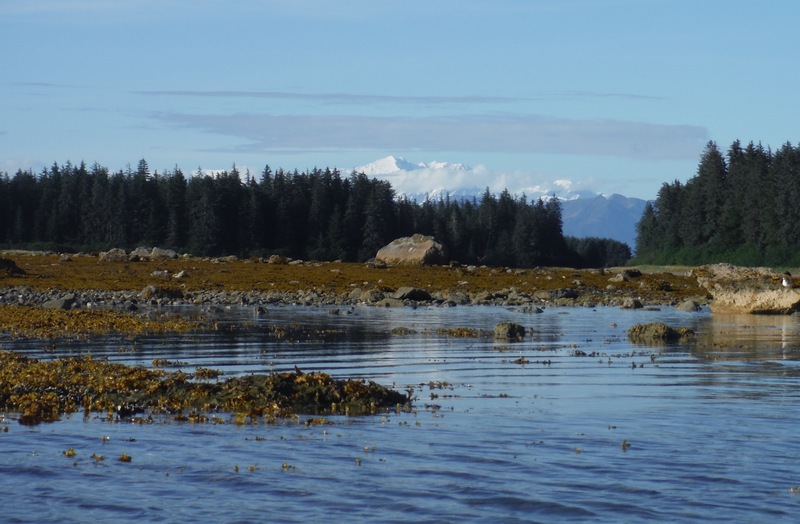 At that point, we also began packing much of our gear and equipment that would be offloaded in Kodiak, as this was the last leg of the summer survey. Although we were not fishing, our camera drops also continued on both shifts. 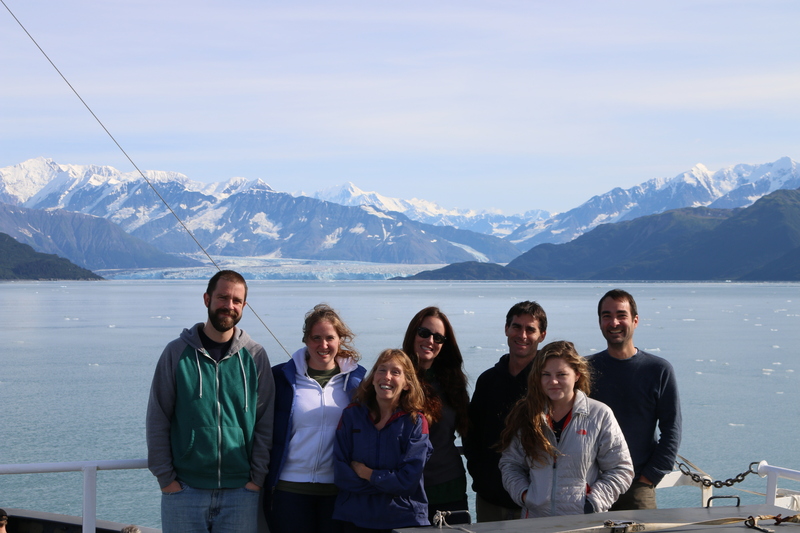 In transit, we were also treated to an awesome view of Hubbard Glacier in Disenchantment Bay. 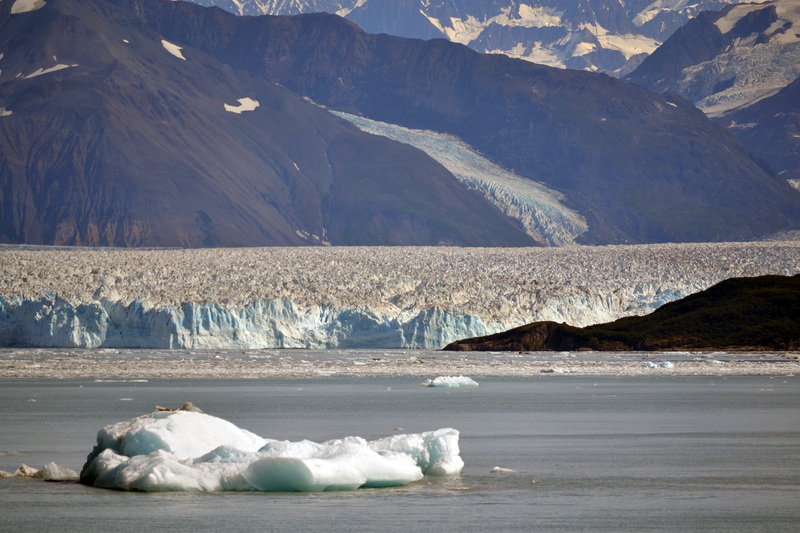 Hubbard Glacier is unique in that, unlike most of the world’s glaciers, it has actually been advancing and thickening for the last 100 years. As we cruised into the bay, we all gathered on deck or on the bridge to take in the majestic tidewater glacier terminating in the sea. We also took the opportunity to get a group picture of our science team! This morning, under the supervision of superior officers, Ensign Benjamin Kaiser (remember him from the interview?) expertly brought the Oscar Dyson into port. 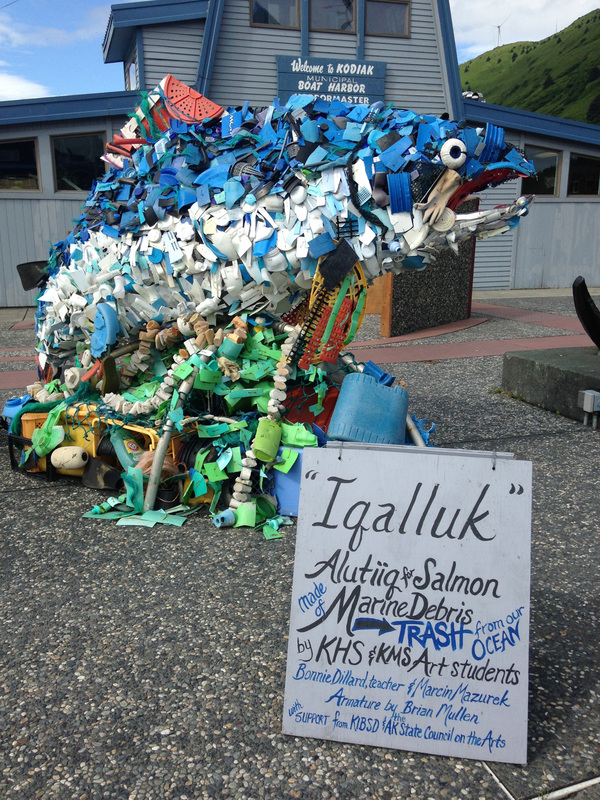 The ship was back in her home port of Kodiak, Alaska, and the science team was ready to disembark and offload our gear. I must say it is a weird sensation to get your “land legs” back after having been at sea for three weeks. I was ready to go to nearby Harborside Coffee and Goods, get myself a good coffee and go for a long walk. I do not fly back to Hawai’i until Tuesday afternoon, so I am looking forward to exploring Kodiak a bit more with some of my shipmates in the next few days. I will also be able to attend a talk tomorrow in which chief scientist Darin Jones will present the preliminary results from this summer’s survey to a group of fisheries industry professionals and other interested parties. I am very grateful to Commanding Officer Arthur “Jesse” Stark and all the officers and crew of the NOAA Ship Oscar Dyson for a safe, productive voyage. 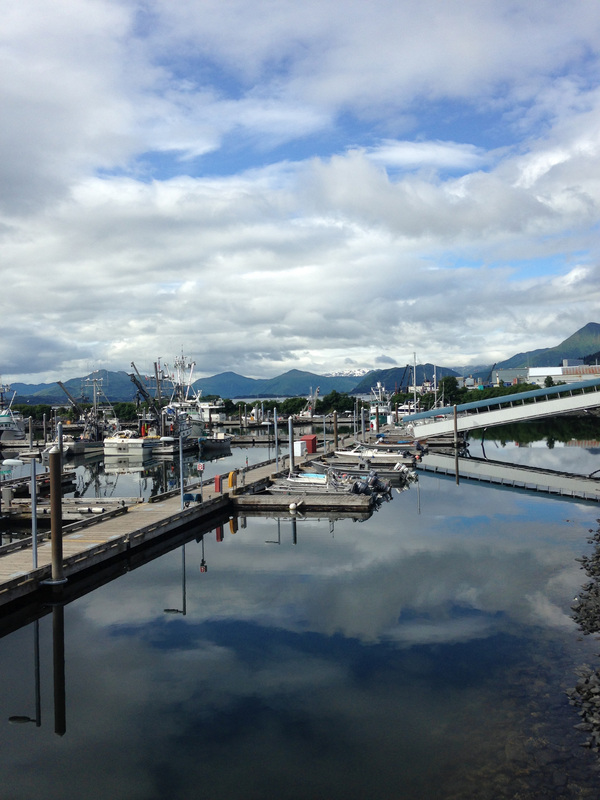 And I would like to extend a big MAHALO to the science team from Midwater Assessment & Conservation Engineering (MACE) at Alaska Fisheries Science Center conducting the third leg of the summer Walleye Pollock Acoustic-Trawl survey! Thanks for welcoming me into your team; you all are dedicated professionals whose passion for your work is obvious. A special thanks to chief scientist Darin Jones for sharing your expertise and taking the time to edit this blog. 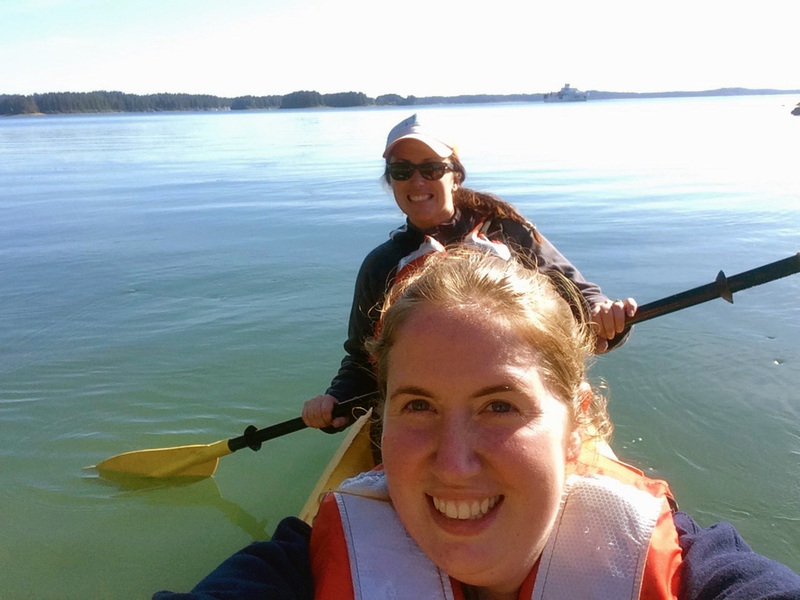 Sailing as Teacher at Sea was a rich, hands-on learning experience. I was impressed by the sophisticated techniques and novel technology helping scientists assess pollock populations, which will eventually inform fisheries management decisions. And working in the wet lab was a lot of fun! In addition to processing pollock, I enjoyed observing all the different creatures we caught in our trawls, from sea jellies to shrimps to all manner of fish. While I will really miss my shipmates, the fisheries work, and the gorgeous scenery (especially those epic sunrises), I am excited to go back and share all I have learned with my students and a larger community of educators. Mahalo nui loa for following my journey. Aloha! 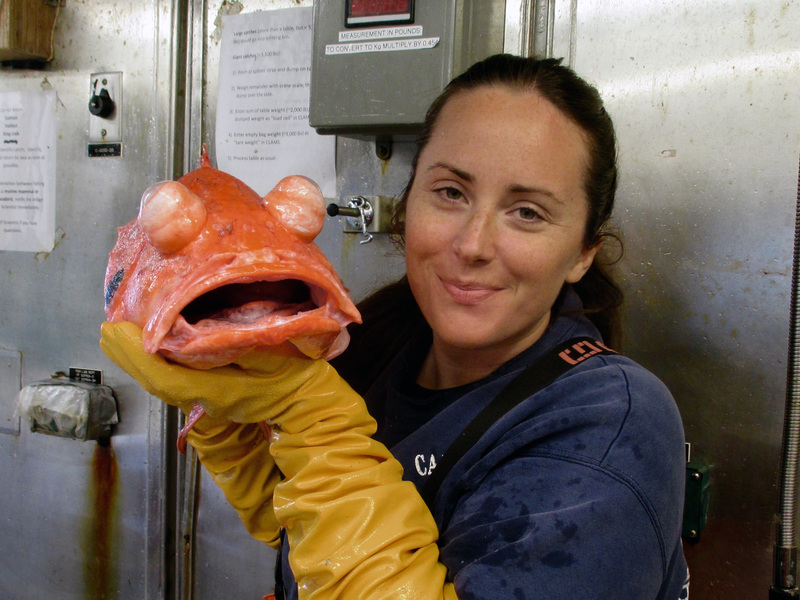 This entry was posted in 2015, Cristina Veresan, NOAA Fisheries Service, NOAA Teacher at Sea and tagged Acoustic Trawl Survey, Alaska Fisheries Science Center, Kodiak Alaska, NOAA Ship Oscar Dyson, Walleye Pollock Survey. Bookmark the permalink.